We spend our lives postponing death; dreading it, fearing it, cheating it. But the fact remains that there is no escape. The more we are able to accept our fatality, the more meaningful we can make our lives, the more passionately we can love and the more present we can be. Embrace life until it is our turn to embark on the unknown journey into what may lie ahead. I am working on this. Working on changing my perspective. Banishing my stress, my worry and my fear and learning how to just peacefully BE. Today is El Día de los Muertos or All Souls' Day. It is a time to celebrate and remember our loved ones. Honoring their spirits is a way to keep our memories of them alive. Today I am remembering two Rubys. One very young and one very old. Grandpa Ru passed away August 19th, 2009. Born Reuben, some people called him Ruby, but we all called him Ru. As I look at his picture, I can see a twinkle in his eye and I hope he can feel the love in my heart. I am happy to say that the tradition of celebrating Day of the Dead is ALIVE and WELL in PDX! It seems this year, more than ever, there are gallery shows, sugar skull making, processions and altars all over town. I find it both enlightening and encouraging! 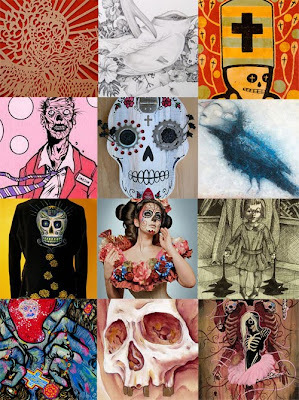 This month, I have been fortunate enough to be included in a 'Muertos' show at Redux on Burnside. I am in the company of 22 other incredible artists -which is a big thrill for me! You can see all the work from the show on this gallery blog. -But please be sure to visit Redux some time this month, you are sure to find many treasures there. The show runs from 10/27 - 11/29. Opening Reception is First Friday, THIS FRIDAY, 11/06 from 6 - 10pm. And on the subject of the moment, I would like to share a few quotes I have gathered. . . The calaveras featured over on the Redux blog, share the road, is really cool! I hope you sell oodles! Now I just have to get over there and check it out. . .